Most men these days have, or will have had, a signature scent. For whatever reason we tend to choose our smell, and generally stick to it. I'd say I was probably the same; I like to try new things as I'm a yes man, but when it comes to buying a new cologne that's a harder sell. 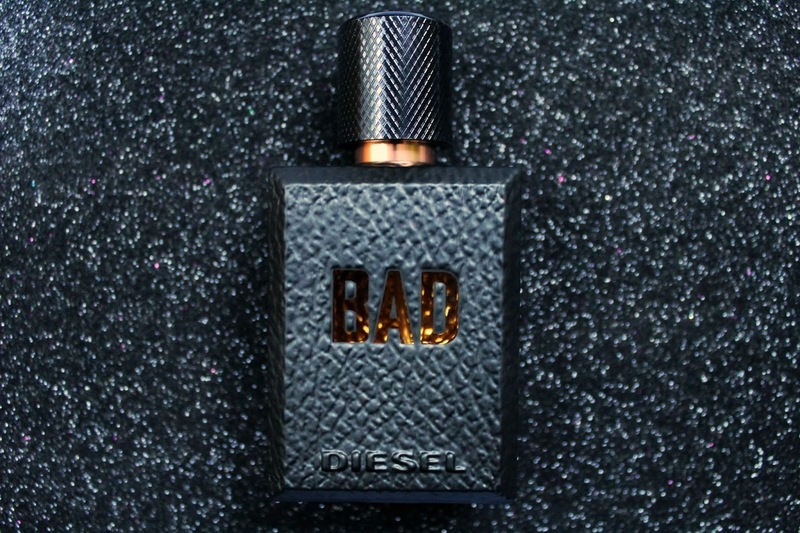 That was until I was contacted to see if I wanted to try out the new Diesel Bad*... 'why not' I said to myself. If you're a regular reader (hopefully!) you'll know I always start with how something looks. Am I drawn to it? Does it set itself apart from the norm? The Diesel Bad bottle does. The matte black bottle looks like it's black leather, with a smooth to touch, but rough looking finish. The bottle itself is actually in fact made from micro-engraved glass. It also has BAD lettering engraved on the bottle which is in a golden, clear glass so you can see inside the bottle, which for me is a really cool and contemporary touch, and it's topped off with a rose gold nozzle. So how does it smell? In my honest opinion it does smell good. Unlike a lot of fragrances which are just too overpowering, this is just right, but I will add I only use one spray from the bottle, as I have found it will last all day with ease. It's moderate scent which carries rich undertones of tobacco and has a natural woodiness to it. It's also packing some warming, yet mild hints of citrus and lavender. Overall this is a masculine smell I've been wearing often as it's something personally I quite like. When to wear it? If I'm honest I'd happily wear this a few times a week but perhaps not always in the office as it's not going to be for everyone due to the rich and rugged tobacco tones. However, like an excited child, when I did receive this I had to get as many people as possible to have a sniff, and most people have given it a thumbs up. So that's for you to decide. At the end of the day, like I said in the opening paragraph of this review, everyone has their own scent and style, so as with all fragrances, pop into a shop and have a go on a tester. I would recommend giving this a go for sure. The bottle looks amazing. I may have to try and catch what it smells like. The bottle is cool yes, worth a look! And definitely go for a blast on a tester yes! So far so good, though I thoroughly enjoyed the scent of my Boss cologne I figured I'd take a stab at something new and am still ascertaining whether or not I feel the difference in price/potency is worth the change?